The retirement tour of Boston Red Sox designated hitter David Ortiz is nearing its emotional conclusion, and the universal praise for the accomplishments of perhaps the most beloved ballplayer ever to call Fenway Park home has been lavished on Big Papi from opposing teams, fans, and a press corps that has long elevated the slugger to folk hero status. You can't argue with Ortiz's legacy in Boston. He was a monster producer in all three of their World Series championships since breaking an 86-year "curse" in 2004, including a number of iconic game-winning hits, and a seemingly inexhaustible supply of toothy smiles. He also had that "This is our f--king city" moment following the 2013 Boston Marathon bombing and followed it up with a season where the Red Sox were an unlikely behemoth — a team coming off two disastrous seasons with no expectations to win — only to become World Series champions backed by a historic offensive performance by Ortiz in the Fall Classic. Big Papi has rightfully been credited with bringing the bat-flip from the no-no side of the "unwritten rules list" to a Muhammad Ali-like understanding that "it's not bragging if you can back it up." This is good. But Ortiz's bat-flips aren't impromptu celebrations, they're thoroughly choreographed affairs, punctuated by record-setting slow home run trots, and a ceremonial pointing to the heavens. This isn't in-the-moment happiness, it's phony marketing. After a particularly showy bat-flip from Ortiz perturbed New York Yankees' manager Joe Girardi in 2011, Ortiz told reporters "that's Papi's style" and advised the opposing skipper to "take it like a man." But when the widely respected Yankees pitcher CC Sabathia plunked Ortiz on the hip the next night — the first time in 161 games against the Red Sox's archrivals where he had been hit by a pitch — Ortiz lashed out at beat reporters, calling them "unprofessional" and blaming them for the brushback he received for showing up an opponent. Lest you think Ortiz has taken a beating from opposing pitchers, note that he ranks 779th among players on the career all-time hit by pitch list, with a grand total of 37. For all the talk of "unwritten rules," it appears that Ortiz's opponents pretty much let him write his own (the guy barely bothers to leave the batter's box unless he's certain he's got a hit), while still aggressively policing other sluggers who excessively admire their home runs. That's fortunate, because lovable Big Papi possesses both a fragile ego and a short fuse. Ortiz's many violent eruptions — which include but are hardly limited to throwing several bats at a group of umpires, endangering the eyesight of his teammates as he eviscerated a dugout phone, and his standard freakouts over pitches that are correctly called strikes — are written off as the "passion" of an intense competitor. 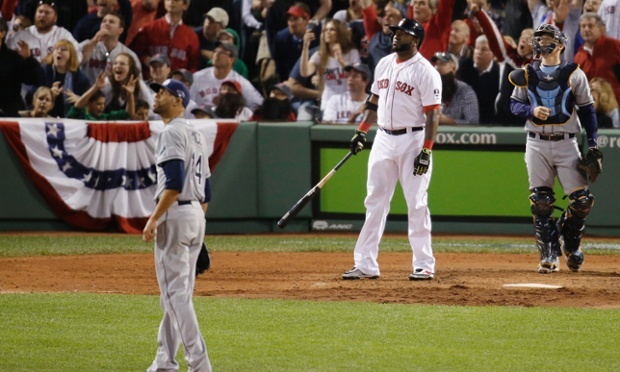 But in truth, Ortiz is as prodigious with his mortifyingly aggressive tantrums as he is with his clutch hitting. But isn't Big Papi the folk hero a real team-first guy? Only if facts don't matter. During the 2012 season, Ortiz said the atmosphere of playing in Boston was making it "the shithole it used to be" again. He also described the $14.5 million a year contract he signed as "humiliating," considering he sees himself as the "heart and soul" of the team. Though in better times, he would interrupt a team celebration to take a corporate-sponsored selfie with President Obama, because that's what team-first guys do, steal the spotlight and literally personally profit off the moment. Exhibiting conduct that would brand less pathologically-excused players as egomaniacal heels, Ortiz has repeatedly demonstrated a fixation on his own statistics. His tendency to complain about the official scorers whenever he feels a questionably batted ball should have been ruled a hit is well documented. But he is a man who likes the spotlight, and in 2011, Ortiz made a spectacle of himself by blasting into his beleaguered manager's postgame press conference to let his field general know how "pissed" he was over being denied what he felt was his rightful RBI during that day's game. It should be noted that this was while Ortiz was playing on a team that was weeks away from a historic September collapse, characterized by a "toxic" and disharmonious clubhouse filled with selfish players. Perhaps this was leadership? Ortiz takes his legacy very seriously. He's not shy about declaring himself a Hall of Famer, despite playing 87 percent of his games as a designated hitter — a position at which no one who has played more than 57 percent of his games has been enshrined in Cooperstown. The argument that he's maybe the best DH of all time, combined with his Curse of the Bambino-destroying postseason numbers, are frequently deployed by Papi-ists as reasons why he — once again — should be considered by a different set of rules. Which leads us to the elephant in the room: David Ortiz's name was on a list of 104 players who failed a PED test in 2003, the same year he went from a marginal player approaching age 30 to launching the legend of Big Papi. The test in question was meant to be an anonymous survey test. Players knew the test was coming, and if more than 5 percent of them failed, mandatory in-season PED testing would begin the following year. That threshold was easily met, and the "post-PED" era technically began in 2004, even though we now know recidivist cheaters regularly beat the league's testing apparatus, and likely will always be a step ahead of testing technologies. But unlike Alex Rodriguez — whose name appeared on the same list as Ortiz and immediately became mud, his career's worth of accomplishments forever perceived as "tainted" — Ortiz was able to spin the narrative to his favor, a narrative that remains the prevailing assessment of the baseball-consuming public to this day. When Ortiz's name was one of seven leaked at different times throughout 2009, the media pitchforks stayed patiently at bay while he stonewalled them for more than a week, saying he was "blindsided" to learn he had failed a drug test but promised to "get to the bottom of this" and tell the whole story when the time was right. When that time finally arrived, Ortiz sat next to the late Major League Baseball Players Association (MLBPA) president Michael Weiner and let the union leader do most of the talking. Weiner — in carefully orchestrated legalese and armed with a fallback excuse that the list contained eight players who tested positive for substances not yet banned by MLB — was at least more candid than the mealy-mouthed Ortiz. Far from getting to the bottom of anything, Big Papi sheepishly offered an apology for being "a distraction," denied ever knowingly buying or taking steroids, and claimed to not know what he tested positive for. Like a manipulative child pleading with a sympathetic adult, Ortiz told reporters, "I never thought buying supplements and vitamins was going to hurt anybody's feelings… If it happened I'm sorry about that." For Ortiz defenders, those have always been his "outs": Either he didn't know what he was taking was a PED, or he was one of the eight sorta, kinda innocent players out of 104 who ended up on a list of positive PED tests, and nobody knows for what substance. Ortiz weathered the storm largely thanks to a pliant sports media accepting his muddled explanations. The story pretty much went away, and when Ken Burns put together a montage of "suspected" steroid users in the 2010 "Tenth Inning" special addition to his Baseball documentary series, Ortiz's visage was conspicuously absent. His sagging output at the plate and apparently broken-down body elicited a weepy eulogy for his career from leading Red Sox propagandist Bill Simmons. But then, Big Papi was back! During the supposedly post-steroid era where guys got old when they were supposed to — the epic seasons put together by Barry Bonds and Roger Clemens in their late 30s during the previous decade now widely perceived as steroid-tainted mirages — Ortiz started putting up numbers unseen by a player his age since, ahem, Barry Bonds. Those few to publicly raise an eyebrow over such a unusual turn of events were deemed big, nasty meanies, or even (gasp!) "haters" for not wholeheartedly embracing the Book of Saint Papi. The mantras defending Ortiz were built around "the test was supposed to be anonymous!" — a defense never afforded A-Rod, Manny Ramirez, or Sammy Sosa — and "he denied taking them!" — which never worked for any other player linked as directly to steroids. Some flailing Papi-istas will point out that he's physically leaner in recent years, as though skinny Dee Gordon's failed drug test never happened. But no justification of Ortiz's late-career output has been as prodigiously deployed as "He's never tested positive since 2003!" That's true. So is this: Barry Bonds and Roger Clemens — respectively the best hitter and pitcher of their generation — never failed a PED test, yet are all but barred from the Hall of Fame thanks to (very reasonably held) steroid suspicions. Another slugger with Hall of Fame numbers, Jeff Bagwell, also looks likely to never be elected to the Hall because of steroid suspicions, even though he has never failed a drug test, nor does he have any known connections to banned steroid dealers. Ortiz, who ESPN's Tony Kornheiser declared a "first ballot" Hall of Famer, does have those connections. His (and Alex Rodriguez's) long-time trainer Angel Presinal has been banned from baseball since 2001 after being caught traveling with a bag of steroids in the company of former MVP Juan Gonzalez, but that didn't stop Ortiz from training with him in the Dominican Republic for years afterward. Even though the story of Ortiz's positive test had long been flushed down the memory hole, Ortiz couldn't help angrily bringing it up several times in recent years. In 2013 he called himself a "warrior" for being able to survive his single non-confrontational press conference over the PED test, adding, "somebody was trying to hurt me." And who might that have been, David? He offered no specifics, but told the Boston Globe that the conspiracy against him was "something based in New York," and hinted that it might have come directly from the Red Sox's archrival New York Yankees. He later wrote an op-ed for The Players' Tribune exclusively devoted to his aggrievement over being perceived in the minds of some as a cheater. He claimed "nobody in MLB history has been tested for PEDs more than me," estimating that he had been subject to more than 80 tests. NBC Sports' Craig Calcaterra noted at the time that either Ortiz was wildly inflating the number of drug tests he had been given, or had accidentally revealed that he had failed a drug test we didn't know about, making him subject to additional testing per MLB's Joint Drug Agreement. Is it possible that Ortiz is the unluckiest slugger in history, and has been clean as a whistle the whole time? Could it be true that in the very season he tested (falsely?) positive for PEDs, he transformed from an unemployed mediocre 28-year-old DH to the most feared slugger of the next decade, and later from a seemingly washed-up walking injury to an ageless superhero (in the kinda, sorta post-steroid era) having a historically prolific campaign in his final season? Anything is possible, I suppose. Credulous fans and obsequious sportswriters will continue to lap up every last pre-game ceremony of Ortiz's farewell tour (the one he swore he'd never take). But while they continue their relentless peddling of the myth of Big Papi, the rest of us should feel confident in this truth: David Ortiz is a jerk.